Network Layout Diagrams visualize the telecommunication and computer network topology and layout. They are used by IT professionals and corporate IT departments, network and system administrators to visually document the layout of computer networks. ConceptDraw has 1004 vector stencils in the 40 libraries that helps you to start using software for designing your own Network Layout Diagrams. You can use the appropriate stencils from Computer and Network Diagrams object libraries. Sample 1. Network layout diagram. ConceptDraw Computer and Networks solution provides samples, templates and library of vector stencils for drawing the computer network layout diagrams. 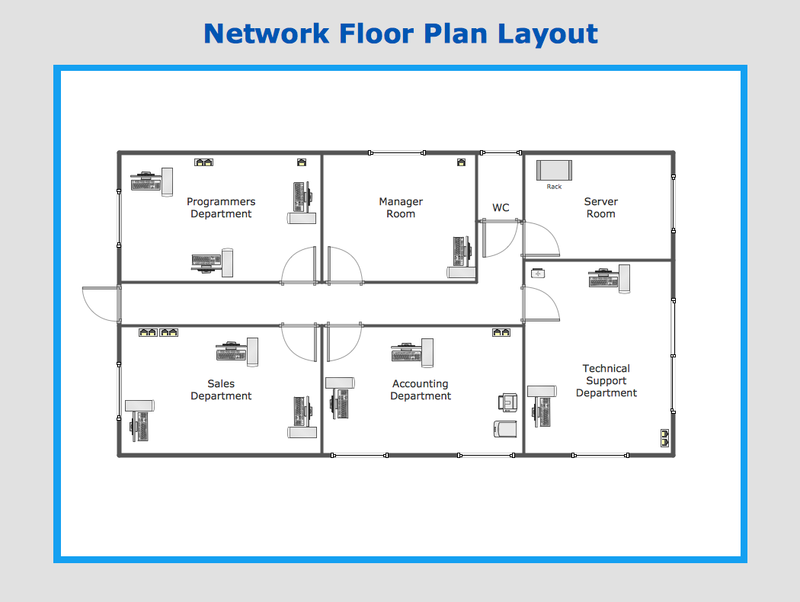 Use ConceptDraw DIAGRAM diagramming and vector drawing software enhanced with Computer and Networks solution to draw your own network layout diagrams that show LAN and WAN architecture, topology and design against the floor plans.